Kitchen Riffs: What is Kitchen Riffs? Flavor. What is it? Where is it? How to achieve it? How to enjoy it? Exploring flavor is the theme of this blog, and we’ll search for it wherever we can find it – if necessary, even looking in all the wrong places. This blog is about finding flavor, learning flavor, preparing flavor. Although Kitchen Riffs’ focus will be on how I prepare food and drink in my own kitchen, I’ll also visit other kitchens – restaurants’ or friends’ kitchens, both at home and abroad – in hopes of discovering new ideas, ingredients, or techniques. There will also be general discussion, thoughts, musings, and philosophical observations about food trends and related subjects. But I’ll try to keep these to a minimum so we can focus on recipes and techniques! I’ll be discussing what I want to eat. Although some of the recipes I present will be original, most will be adapted – riffed – from other sources. These sources will always be identified. There are few truly original ideas in cooking. 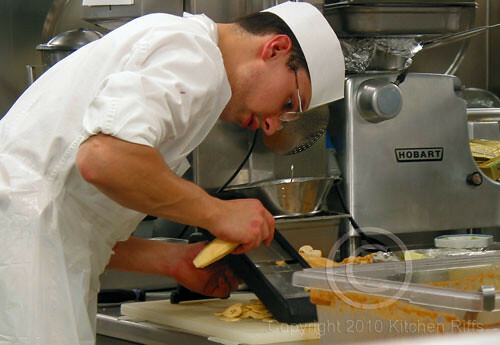 Most of us riff in the kitchen – changing recipe ingredients or even techniques in order to prepare something better suited to our individual tastes. It used to drive my wife nuts to see me read a new recipe — and then prepare it for the first time with substantive changes. But my wife likes to bake, while I like to cook. Riffing works with cooking. Not so much with baking. Playing with baking recipes is tricky because the baking process involves more precise chemical changes. I tinker with recipes because I’m trying to figure out what works best for me, for my taste. In order to tinker effectively, I have found, one needs to develop a process for grasping the essentials of a recipe and then recognizing where different inputs – alternative spices, for example – might have a positive effect. In that spirit, I want this blog to be more than just me talking about what I know. I want it to be about recognizing what I don’t know, but need to learn in order to cook (and eat) better. The idea is to find out what is important in cooking, and why. My goal is to figure out how I really want to eat and cook. It’s pointless to publish a food blog today without including photographs. Everyone expects them. Some bloggers publish gorgeous, professional-quality photographs. Unfortunately, mine will not rise to that level. Although I’m an enthusiastic amateur photographer, amateur is the operative word when it comes to my skillset. Many food blogs publish photographs detailing every step in the preparation of a recipe. I like this technique and enjoy reading those blogs. But I won’t be doing that, either. For the moment at least, I don’t think that presentation suits either how I cook or how I want to talk about recipes. But I will incorporate some photographs into my posts (often quite a few). Figuring out how best to do it will be a work in progress. To be honest, I’m including photographs here in part because I’m trying to learn how to incorporate pictures into a blog post! I’ve never done it before. The inclusion of these photos isn’t entirely gratuitous, however. It’s always fun and educational to observe other people cooking, particularly professionals. The pictures accompanying this post are from a galley tour that my wife and I took during a cruise on the RSSC Voyager. The Voyager is a midsize ship, with a passenger capacity of 700. Dinner is “open seating” (that means you can just show up when you want, with whom you want, during the hours the dining room is open). Everything on the menu is prepared to order — unlike some of the larger cruise ships, where meals are cooked ahead, banquet-style. The galley tour took place in mid-afternoon, and dinner service didn’t begin until 7 PM. 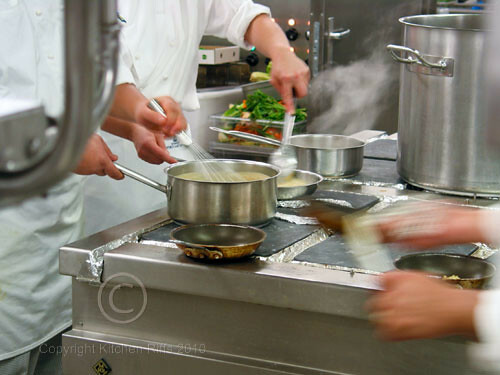 Yet the galley was already in a state of controlled chaos as cooks busily prepared ingredients for that night’s dinner. Cookbooks, especially French ones, often stress the importance of mise en place (“everything in place”) — that is, setting up ahead of time all the ingredients and other items that will be needed to prepare a recipe or meal. Well, mise en place was happening before my eyes, big time. The same process goes on daily in landside restaurants around the world. 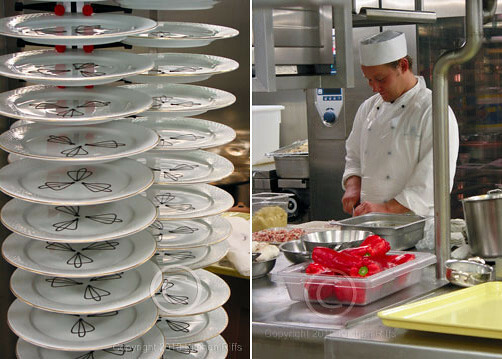 All this prep work, the ship’s executive chef told us, was necessary so that during dinner service the chefs could quickly and smoothly prepare orders as they came in. No frenzied searching for chopped parsley to garnish a plate! We home cooks all know that we should complete our own prep work before we start cooking. Sometimes we even do it . . . . These early posts are in a sense my blogging mise en place. Before I started out, I knew I wanted to write a food blog, but the how and why were ill-defined. These early posts, and a few more to come, will help me outline what I’m doing and why. So in the very near future, when I begin blogging properly, I’ll be able to write with better focus and (I hope) clarity. Writing is learning, so as I proceed, my focus and goals may change. But at least my parsley will be chopped!